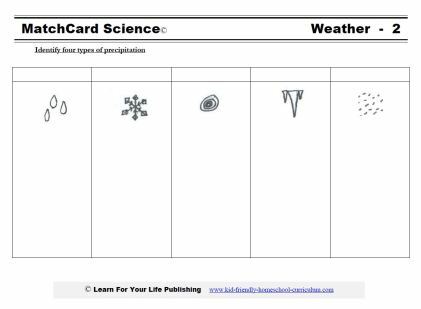 The 5 Types of Precipitation lesson plans and MatchCard compare rain, snow, hail, freezing rain, and sleet. 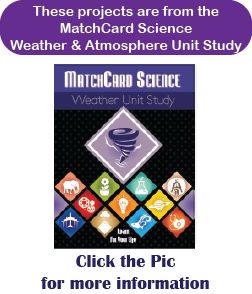 This is MatchCard #2 of the Weather Unit Study. Find more information on MatchCard Science below. Objective: Identify the five types of precipitation. Water particles in the clouds may become too heavy to remain in the air, and are pulled to the earth's surface by gravity as precipitation. With this MatchCard, precipitation experiments will be done to investigate the five different types of precipitation: rain, snow, hail, freezing rain, sleet. In weather, precipitation is water falling to the ground from the atmosphere. The water can be in a liquid, solid, or semi-solid form. In chemistry, a precipitate is a substance that forms out of another substance - usually a solid that precipitates out of a liquid. In weather, the precipitate is the liquid or solid particles that come from the air in the atmosphere. In our usual day to day language, we simple refer to it as rain or snow. But there are other types of precipitation as well. These lesson plans focus on five kinds of precipitation. Before looking at the illustration in the MatchCard, examine the shape of water drops. Have them drop slowly from the faucet or a water dropper. Let the students draw the shape. Buy or make a rain gauge for these precipitation experiments. (See below for the link to the page with our instructions to make a rain gauge.) Measure the amount of precipitation that falls in the next rain storm in your area. Snow is frozen water vapor. It contains a mixture of H20 and air molecules. It creates beautiful snowflakes. Wet snow has a higher concentration of H20 and a lower concentration of air molecules. The H20 molecules are a little more "melted" than dry snow. Dry snow occurs when the temperature is well below freezing. The ice takes on the well known crystal shape. The snow outside is firmer. It weighs less than wet snow because it has more air. It is more crunch and easier to shape. Use a magnifying class to examine snow crystals. See how many different types you can identify. Can you measure the snow flakes? If you do not have access to snow, use ice crystals that have formed in your freezer compartment for your precipitation experiments. Hail occurs as raindrops freeze in a tall cloud. The frozen rain falls, but an updraft within the cloud sends the raindrop back up. As it moves up, another layer of water forms around the initial piece of hail, and it gets larger. Each time the hail moves rises and falls within the cloud, it becomes larger from another layer of water molecules. Eventually it becomes so heavy that gravity pulls it out of the cloud and it falls to the earth. Hail can cause damage to crops. Large pieces of hail can leave dents in vehicles. If you have a hailstorm in your area, gather pieces of hail after they stop falling. Measure the different pieces. The best part about freezing rain is the icicles. Freezing rain refers to liquid raindrops that freezes when it hits the surface of the road or other object. This can form a glaze that is dangerous to drive in. Freezing rain forms icicles. Most people agree that the icicles are the nice part about freezing rain. Walking on a sheet of ice is no fun. Sometimes the freezing rain covers a cover in ice and the door won't open. The icicles aren't so much fun then. Sleet is also frozen water. Unlike freezing rain, sleet freezes before it hits the ground. People might say, "It is sleeting outside." You hear the sleet fall as little pings against a window as the frozen pellets hit. Unlike freezing rain, you won't have any trouble walking on the ground when it is sleeting outside. You might not like to have those frozen pellets hit your skin. They are too small to injure you, but your skin probably won't appreciate all those little pieces of ice bouncing off it. They are interesting to pick up and look at, however. Use hands-on projects to understand precipitation better. We have a whole page of ideas to use. They can be found on the links below and on the MatchCards that can be downloaded on the next page. Find the true amount of precipitation that has fallen. From gentle breezes to hurricanes and tornadoes, changing atmospheric conditions impact our day to day life. Turn your students into junior meteorologists with our Weather Unit Study. Nine different weather lessons can be presented in this 4 week study. 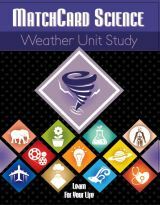 Download the entire Weather Unit Study.